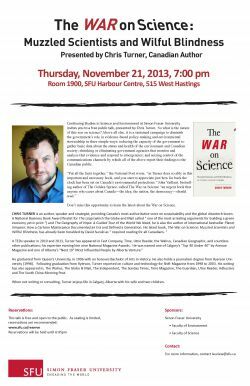 Continuing Studies in Science and Environment at Simon Fraser University invites you to a free public talk, presented by Chris Turner. So what is the nature of this war on science? Above all else, it is a sustained campaign to diminish the government’s role in evidence-based policy-making and environmental stewardship in three simple ways: reducing the capacity of the government to gather basic data about the status and health of the environment and Canadian society; shrinking or eliminating government agencies that monitor and analyze that evidence and respond to emergencies; and seizing control of the communications channels by which all of the above report their findings to the Canadian public. Don’t miss this opportunity to learn the latest about the War on Science.